The Thai industry is still relatively new, having had a slow staggered start in the 1940’s, and a flourish of a feature in 1979, the industry only really started in earnest early this century. This post is a precursor to the extended research that aims to begin to identify characteristics of Thailand’s Animation’s through historical research, collation of academic discussions on the South East Asian productions, interviews with key players in the Thai animation industry and education, questionnaires to current students of animation and analysis of key works. So this is a trace over the history of the main commercial productions up to the present to set the context for the future analysis. Thailand is of course no exception to the cultural hegemony of Nationalism; the ideology of ‘Thai-ness’, is literally the notion of “Thai” and “un-Thai”, was originated in the 19th century by King Mongkut, Rama VI. If we trace through Thai animation this ideology is visible right from the early educational films by Sanae Klaikluen, created in 1945, simplistic narratives that instructed people to wear hats and farmers to wear boots. 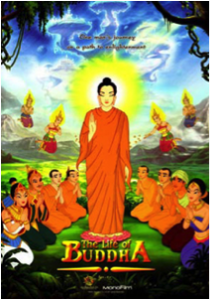 This continued through in the commercial works, such as Bo-ree-boon Balm of Payut Ngaokrachang who is recognised as the father of Thai animation. In his animation short based on his newspaper comic strip, “Haed Mahasajun”, we see a policeman directing traffic – his dance-like motions strike a chord with Thai audiences still familiar with the traditional Ram Thai dance full of coded hand gestures. 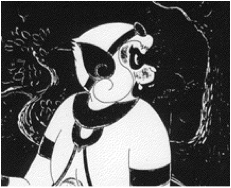 In the ‘Adventures of Hanuman’ based on the Ramakien epic, funded by the United States Information Service, he focused on the Hindu monkey god, Hanuman, in combat against a red monkey. There are overtones of an anti-communist agenda in the story influenced by the political currents prevalent in South East Asia at the time. 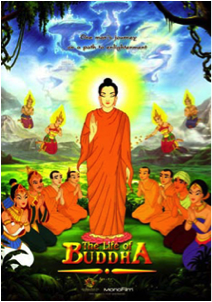 The then Thai government banned this film but when there was a change in government to ‘Jom Pon Tanom’ government, and they decided to broadcast this animation. Similarly he made ‘the Boy and a Bear’ 1960 based on the theme that unity was necessary to combat communism. 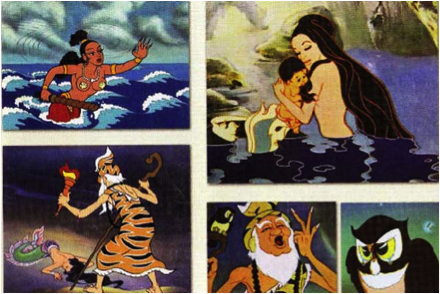 However it was in 1979 Payut made the pioneering stepping stone in Thai animation, “The Adventures of Sudsakorn” the style and content were driven by classic Thai art and it features Sud Sakorn, the boy hero, son of a mermaid and a wandering musician-prince, on his adventures he fights with an elephant, a shark, a dragon horse (Thai classical mythology) , as well as encounters with a king, a hermit, a yogi, a magic wand and ghosts, all common themes in traditional tales which continue through to current cinema. 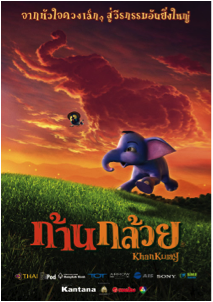 In 2006 Kantana Studio’s feature film ‘Khun Klauy’ directed by Kompin Kemgumnird was released. A story of an elephant and his role as the war elephant for King Naresuan in the defeat of the Burmese in the Ayutthaya Period of Thai history, (16th Century) it has been described as ‘extremely nationalistic’, (Jit Phokaew 2008) – the backdrop is the war with the Burmese, the caricature of which holds true to the Thai historical bias. The main storyline is however, the elephant’s own character arc. On interviewing Kompin in February this year, he explained how during production Kantana had felt the film was lacking in the essential Thai-ness. 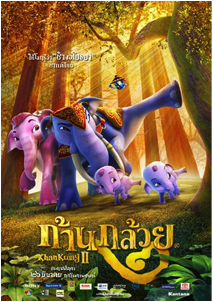 As only the second animated feature in Thai history the team worked hard to develop the Thai identity in the visuals and storyline, in particular adding an early scene where the king as a boy meets the elephant and we view the perceived aura and charisma of the King. 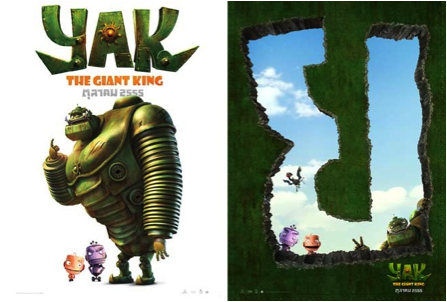 Then Khan Klauy II (2009) dir Taweelap Srivuthivong, the sequel to the success of Khan Klauy which did not have the , following the trends of large US studios ; Yak the Giant King (2012) directed by Prapas Cholsaranont, a futuristic robot version of the Hanuaman story. There are other more subtle idiosyncrasies specific to Thailand, in particular the perceived ‘grean-jai’, meaning considerate and respectful, that is seen as the heart of Thai-ness. 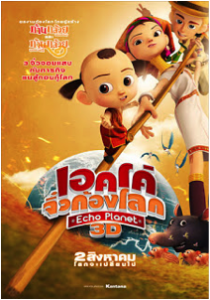 In 2012’s ‘Echo Planet’, again directed by Kompin, the film offers a change in the dominant narrative and plays with an unexpected paradigm – the heroine is a long neck Karen girl, Norah and her younger sibling Jorpe, a young boy who follows in his shaman Grandma’s gift to talk with nature. They are set up against the technologically driven corporate evil polluters from Capital State (a thinly disguised America) and find themselves facing the United Nations Council to help prevent destroying the planet. 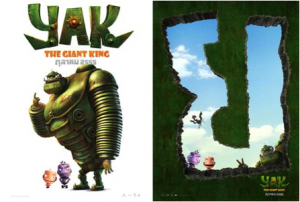 Norah is seen at one point admonishing Sam, the antagonist American boy scout son of the president of Capital state, for his lack of respect for the elders and the ancient Karen ways; later he has to shift his viewpoint and join Nora and Jorpe to save the planet. This dynamic-duo offer guidance to Sam and in turn demonstrate to the audience about ‘grean-jai’. The film suffered at the box office through distribution issues and the difficulty of competing in the global market. It may take a while to develop the confidence of the producers and distributers to recognize the international value of the Thai national narratives, but really warrants a second, even an initial first look. It is entertaining and refreshing in its narrative and ideological perspective and brings to the fore a new kind of hero: a strong girl who doesn’t need to have a romantic lead, just strong held beliefs and love for her young brother. In the near future we are going to see other narratives that may challenge universal ideologies and open up the heart of Thai animation further to global audience’s consideration, respect and perhaps even open up all our hearts? Millie Young has lectured at Mahidol University International College, Thailand on the Animation Major since 2009. Teaching 2D animation to undergraduate students. Their ideas and design have a distinct look and feel, often influenced by Japanese Manga and from the US animation giants, but always with a Thai twist. Originally from the UK she has taught animation from high school to University since 1992. A animation practitioner she made ‘Tally Bloody Ho!’ in 1999 as part of the Arts Council/Meridian TV Taped Up series, winning the Meridian TV award 1999. The Transformation of Asian Animation: 1995-Present Asian Cinema, Volume 18, Number 1, March 2007 , pp. 105-136(32) Lent, John A.
Payut Ngaokrachang’s 1957 short film, The Adventure of Hanuman. Its wonderful to read about animation’s other histories, and to discover surprisingly common pre-occupations across Asia. Is it possible to watch Sanae Klaikluen’s educational films online? Anitha, So far I have had no success in tracing any online evidence of Sanae Klaikluen’s work. Let me know if you have any luck.